Harcon NPU is a BBA approved, high performance, non permeable underlay. 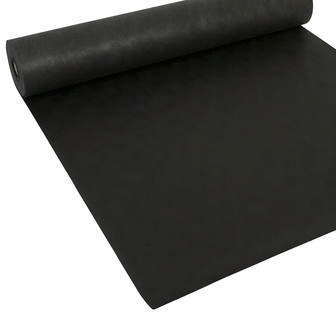 It is suitable for use on both warm and cold roof applications and is completely watertight. Harcon NPU must be installed and fixed in accordance with the Certificate holder's instructions and the relevant recommendations of BS 5534:2003 and BS 8000-6:1990. Installation can be carried out under all conditions normal to roofing work. The product should not be laid directly onto insulated sarking board but can be laid on timber sarking in conjunction with counter battens. The lining, when installed as a cold ventilated roof system, is fixed in the traditional method for roof tile underlays, i.e. draped between the rafters, or used in conjunction with counter battens. When used in a hybrid warm roof specification, a ventilation gap of at least 20mm between the insulation and the underlay should be allowed. A vapour control layer should be used on the underside of the insulation. Laps should be installed to shed water out and down the slope. Overlaps must be provided with the minimum dimensions given in the below table. Hips and valleys should be covered with a 600mm wide strip of the product. In closed eaves constructions, eaves guards should be used.